In India and elsewhere, participation by female students in most disciplines tends to decrease along the academic pipeline. In her paper ‘A Grand Gender Convergence: Its Last Chapter’, Claudia Goldin, Henry Lee Professor of Economics at Harvard University, lists the growing convergence in the roles of men and women as “one of the grandest advances of mankind in the last century”. Citing data from the United States, she illustrates how female workers are catching up with male workers on many parameters related to formal engagement with the labour force. Whether it be labour force participation rates, incomes, paid hours of work, leisure hours at home, lifetime experience in the labour market or educational qualifications, data reveal that men and women are becoming increasingly similar. Analysis of language trends also supports this idea of growing gender convergence, albeit a bit differently. 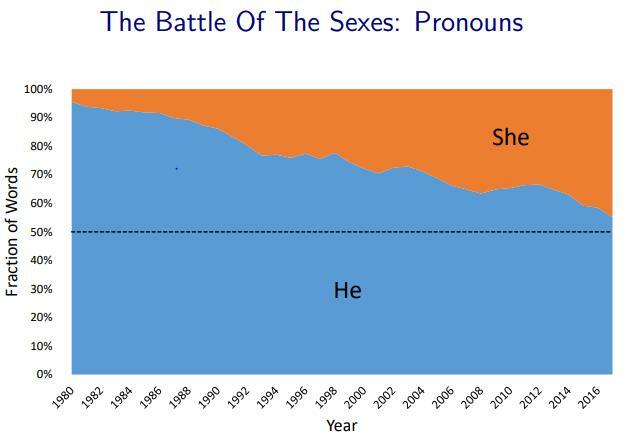 In a set of slides that surveys public economics literature (focusing on National Bureau of Economic Research papers since 1975), Henrik Kleven, professor of economics at Princeton University, finds that the share of usage of female personal pronouns (she, her, hers) in papers which mentioned personal pronouns at least once has gone up from below 10% in 1980 to nearly 45% in 2016. This could partially reflect that an increasing number of the authors being cited in these papers are female. While considerable progress has been made, a look at the numbers suggests there is significant scope for improvement even in the ivory tower of academia. The recently released Ministry of Human Resource and Development’s All India Survey of Higher Education Report 2017-18 throws up some numbers on representation that are worth highlighting. One metric to gauge gender representation is the ratio of female to male teachers at different professional levels, which now stands at 72 female teachers per 100 male teachers. When distilled under different professional levels in Table 1 below, the unequal representation becomes clearer. While there are 189 female tutors per 100 males, at the professorial level the ratio comes down to 37 females per 100 males. AISHE reports from previous years reinforce the stylised fact that female representation decreases with academic seniority. 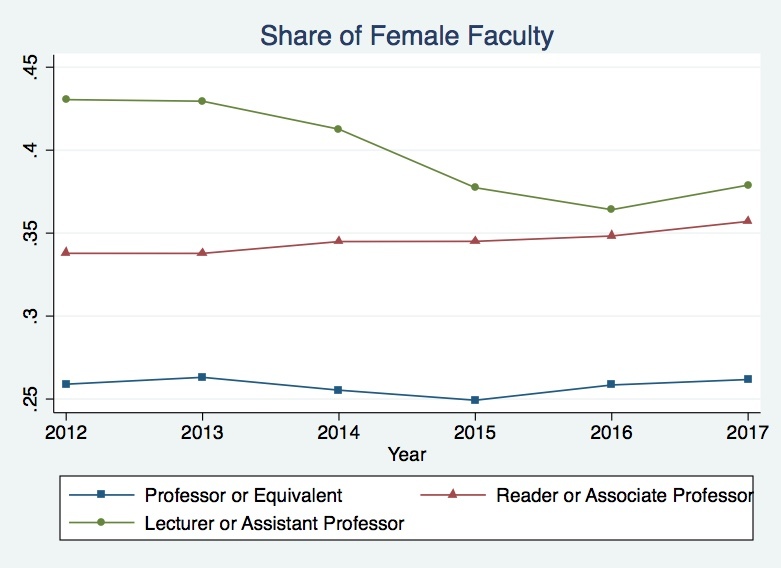 The share of female professors has consistently been the lowest and has remained nearly stagnant over the last six years. Female representation among associate professors has remained similarly stable, but the share of female assistant professors has declined over time. Though disaggregated data by field of study are not available for teachers, data on student enrolment in higher education indicate a ‘leaky pipeline’. In each year since 2013-14, there were more female students graduating with postgraduate degrees (MA, MSc, MPhil) than male students, in both science and social science categories. However, there were more males among the students receiving PhDs. This trend in India matches what is seen in universities elsewhere: participation by female students in most disciplines tends to decrease along the academic pipeline. This gender gap in representation is not exclusive to India. Jobs in academia broadly fall into two categories: tenure-track positions with a greater emphasis on research, from which one can be promoted to become a permanent, tenured professor, and non-tenure track positions which are often characterised by lower pay and higher teaching and administrative loads. In US universities in 2015, 22.1% of the female faculty were in non-tenure-track positions, compared to 16.8% of males. 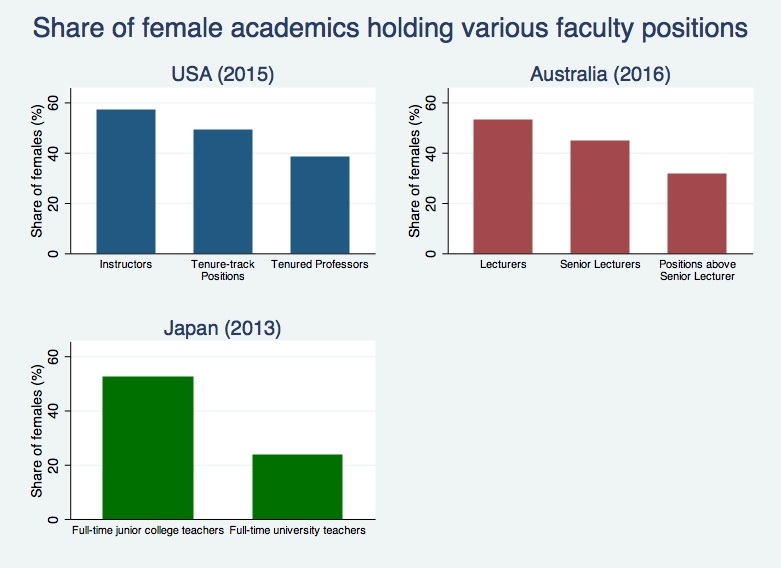 The chart below depicts how the share of female academics decreases as we move up the academic hierarchy in the United States, Australia and Japan. In particular, though 48.9% of tenure-track positions were held by women in the US, only 38.4% of tenured professors were female, possibly suggesting differential promotional rates for women. The AISHE report additionally discusses gender parity in student enrolment in higher education and the representation of various socio-religious minority groups in teaching positions. However, it does not offer any numbers on the existence of a pay gap in Indian academia or other work sectors. The gender pay gap conventionally refers to a relative difference in the earnings of men and women. The Monster Salary Index 2017 report, prepared in collaboration with IIM Ahmedabad, divulges a median gender pay gap of 24.8% across eight sectors in India. The gap is narrower in the education and research sector, where it amounts to 14.7% on average. The Times Higher Education (THE) 2018 survey reveals that women in UK universities are paid a mean hourly rate, that is, on average, 15.9% lower than the rate paid to men. Higher education in the UK fares among the worst performing sectors with a pay gap of around 10%. In the US, the existence of pay differentials between female and male PhD holders is common across almost all fields of science and engineering. 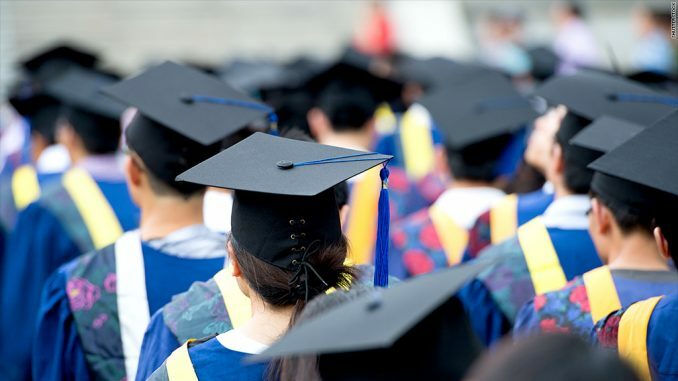 The National Science Foundation (NSF) report estimates an overall median pay gap of nearly 22% for those who earned their doctorate in 2016 and had a confirmed permanent employment opportunity. Ideally, calculations should account for differences in fields/specialisations of work, hours of work and other observable factors besides gender which could be driving the difference in pay. It is worth noting that the statistics presented above represent simple averages of the difference in earnings between men and women. They could be overestimating or underestimating the extent of the gap; interested readers can refer to the methodology here. Several (often controversial) hypotheses have been proposed to explain the underrepresentation of women in academia: women avoid careers that require them to work long, inflexible hours; women are ‘less able’ than men to enter highly selective fields; women perform less well in fields that require ‘analytical, systematic reasoning’. Many have also argued that the gender gap can partly be attributed to discrimination. Leslie and Cimpian et al. published a study in the journal Science in 2015, arguing that a strong predictor of female representation in various academic fields was how emphatically that discipline emphasises the belief that ‘brilliance’ is critical for success. They propose this may have a differential effect on males and females looking to pursue careers in that field, and might partly explain the low representation of women in fields like physics and philosophy which idolize ‘geniuses’. Stereotypes about women’s intellectual abilities, compounded by the confidence gap between women and men, may, therefore, make it less likely that women will pursue academic careers in these disciplines. Labour market discrimination only tells part of the story. Milkman, Akinola and Chugh (2015)present experimental evidence from the US on discrimination along the pathway preceding the decision to enter academia. When considering requests from fictional prospective students seeking future meetings and mentorship, academics were significantly more responsive to those whose names signalled that they were Caucasian males rather than Caucasian females and minorities (Black, Hispanic, Indian, Chinese). Their findings suggest that faculty members often fail to offer women and minorities similar encouragement, guidance, and research opportunities as those available to Caucasian men prior to formal applications to doctoral programs. Even after being appointed as junior faculty, women face several competitive disadvantages in securing tenured positions. Mengel, Sauermann and Zolitz (2017) use quasi-experimental data from teaching evaluations at the University of Maastricht, Netherlands, where students were randomly assigned female or male instructors. Female instructors received systematically lower teaching evaluations, even though student grades and self-study hours were unaffected by the instructor’s gender. They find the bias was more pronounced for mathematical courses and junior women, and was largely driven by male students’ evaluations. Babcock, Recalde, Vesterlund and Weingart (2017) demonstrate through faculty surveys and experiments that women are more likely to be requested to take up low-promotability tasks and are also more likely to agree. Surveys have shown that female faculty spend fewer hours on research and are more involved in low-promotability tasks like committee work and advising undergraduatescompared to their male colleagues. Time spent on such tasks leaves them with lesser time to focus on publications – which constitute an important factor in tenure decisions ­­– and could partially explain why female academics typically have a slower career progression. We now turn to a brief exposition of our own field. A great deal of recent research has evaluated the diversity of economics departments in the United States, and the pathways contributing to faculty composition. In 2014, of the 500 doctorate degrees awarded in economics to US citizens and permanent residents, only 157 were awarded to women. This, though, is a marked improvement compared to 1970, when only 5% of PhDs awarded to US citizens went to women. However, despite women entering the field, the tenure gap in economics is particularly large and persistent. The convention of listing authors’ names alphabetically makes it difficult to determine the extent of each author’s contributions. Sarsons (2017) argues that female academics receive less credit for co-authored work compared to men. She finds that male and female academics who mostly write individual papers have similar tenure rates. However, each additional co-authored paper increases the probability of achieving tenure by eight percentage points for men, but only by two percentage points for women. This gap relative to men is smaller for women who co-author with other women, suggesting that the credit attributed to women tends to be lower when they work with male colleagues. In sociology, where authors are listed in order of contribution, men and women receive equal credit for co-authored papers. The confidence gap may also have a role to play. A working paper by Sarsons and Xu from 2015 shows that even among top economists in US universities, women are less likely to ‘strongly agree’ or ‘strongly disagree’ with survey questions about the economy than men. Moreover, they report a lower level of confidence in their responses compared to men when asked about the accuracy of their answers. This appears to be driven by lower confidence among female economists when answering questions outside their specific fields of expertise. Ginther and Kahn (2004) demonstrated that women are less likely than men to progress at every stage of their academic careers. Specifically, women in economics are less likely to be promoted to tenure and take longer to achieve tenure than women in other academic disciplines. Their results show that on comparing male and female economists with similar education, ability, research productivity and family circumstances, men remain significantly more likely to be promoted to full professorship. According to Claudia Goldin, this problem is systemic to the field and the scarcity of women in economics may be related to the way it is taught to undergraduates. These results are more robust than the comparisons of average pay and suggest that the professional experiences of female academics remain systematically different from those of their male colleagues. As documented by India’s AISHE reports and extensive surveys worldwide, there remain substantial gender gaps in representation and remuneration in academia. In the Indian context, this debate has largely focused on aggregate pay-comparisons between male and female workers. However, there is much to be gained from a closer examination of the state of minority and disadvantaged groups. It is well-documented that relatable role models play an integral role in influencing the career paths of younger generations from their communities. This could be essential to promote and preserve a rich intellectual tradition in each discipline, infused with diverse perspectives. As Goldin writes, “There are many aspects to the convergence, and each can be thought of as a chapter in a figurative book. The big question is whether the last chapter, in which the economy achieves full equality, can be written. And if so, how?” Writing this ‘last chapter’ indubitably requires collaborative co-authorship with those who have been historically underrepresented. As the government formulates and debates its new National Education Policy, it must remember to mind the gap. Aniruddha Ghosh recently graduated with an MSc in Econometrics and Mathematical Economics from the London School of Economics. He will be joining the Department of Economics at Johns Hopkins University as a doctoral student this fall. Shreya Tandon recently graduated with an MSc in Economics from the London School of Economics and Political Science. She will be joining the Department of Economics at Princeton University as a research associate this fall.